Having managed a couple of forums in the past myself, I'm pretty sure there's an option to enable users to upload their own avatars. Of course, they can be limited by both file size and dimension. This would help out a lot because it would cut down on the admin having to check the avatar submission threads (huge time saver) and would allow us to freely switch between avatars at any time. 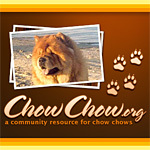 Having hundreds of pics of our chows, my wife and I would probably benefit from being able to upload our own. The only reason I can think of to not enable this function would probably be inappropriate content, but now that the forums allow attachments and have always allowed custom sigs and the [img] tags, I don't think that's as big a risk. Don't close the "Avatar Submission" forum though because not everyone knows how to make their own, but instead rename it "Avatar Requests" - a place where members can post the pics they want made as avatars and any member can 'pick-up' the request and make/upload desired avatar themselves. My wife and I submitted an avatar last week, already properly resized to 80x80 and compressed to less than 8kb and a week later, the avatar still hasn't been uploaded. This would help a lot. Juan, your Avatar has not been loaded yet because ChowAdmin has been out of town on business. I know he'll reply back to you when he returns. Zhuyos mom wrote: Juan, your Avatar has not been loaded yet because ChowAdmin has been out of town on business. I know he'll reply back to you when he returns. Oh, ok. no prob. I still think it would be a good idea though. That way anyone can make their own (and others) avatars and save him the trouble. Yes the forum does have that capability and we used to have it on, but it caused more problems and support issues. So I decided to keep it a manual process. I do check about once a week for new avatar submissions, but as Zhuyos mom said I've been out of town on business the last week. Your two avatars have been added to the Members_02 avatar gallery for your selection. Feel free to post as many avatars as you like.